"I Just Spent Three Nights in Pure Heaven!! 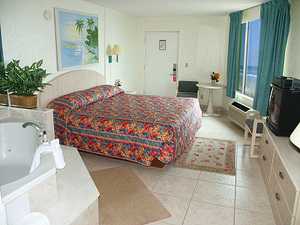 Thanks to all the staff and Owners of the Atlantic Ocean Palm Inn! The views are awesome and the room was so clean and I will be back for SURE!" Max Occupancy: 2 Gorgeous ocean front room with King sized bed, jacuzzi tub, seperate bathroom, newly renovated kitchenette including granite counter top, refrigerator, microwave, stove with oven and coffee maker. Spectacular view.